There are two things you can never go wrong with; fresh cherries and dark chocolate! 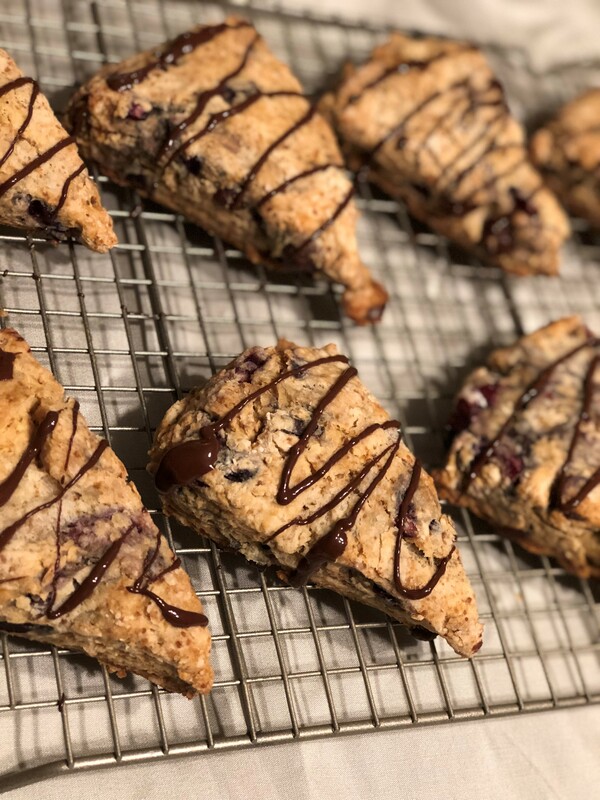 These scones were thrown together and are perfect for dessert or an on-the-go breakfast. Spread a nut butter on them or pair it with eggs and you’re set. My friend loves these and refers to them as “cookie pies” haha. I’m sold for anything that tastes like a cookie and a pie! The Good in this? Dark chocolate is a good source of iron and various other minerals, and cherries are full of potassium, antioxidants and vitamin A. Combine dry ingredients. Cut in butter using a pastry cutter or two knives. Add cherries and chocolate. Combine milk, apple cider vinegar, and vanilla in separate bowl. Make a well in the dry ingredients and add the wet ingredients. Stir until just combined. Don’t overmix to avoid tough scones. Roll dough out to 3/4″ thick. Using a pizza cutter, slice dough into eight triangles. Bake for 15-20 minutes until golden brown.